Special counsel Robert Mueller’s report on Russian interference in the 2016 election is set to be sent to Congress on Thursday, but the fight to get the full, unredacted, or at least minimally redacted, report is already fiercely underway. 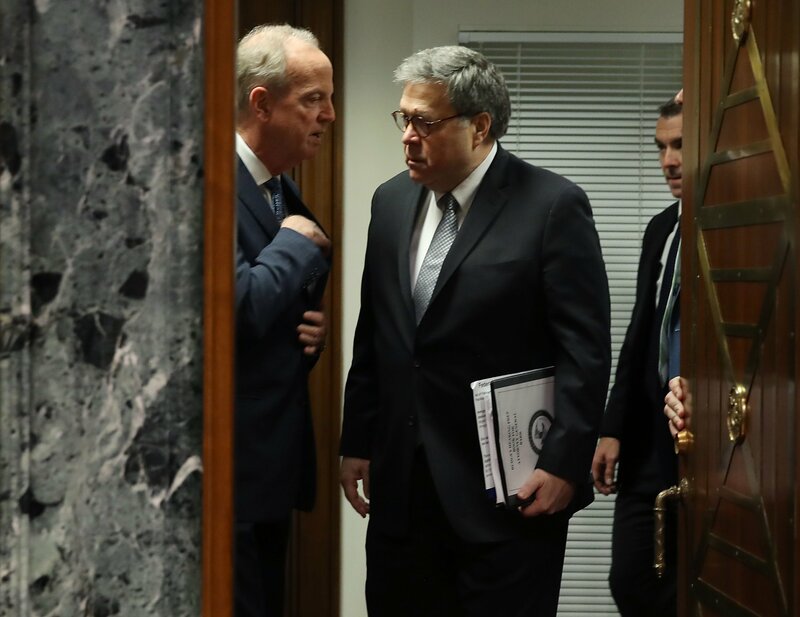 Attorney General William Barr and his team have spent the last few weeks carving away at the nearly 400-page report and proclaiming varying degrees of exoneration for President Donald Trump. At the same time, Democrats and others have been making moves to ensure that Trump loyalists don’t hide the potentially damaging parts for the president forever. But if all else fails, there is another, more dramatic, avenue open to get the full report out to the world. One of the most famous whistleblowers of modern American politics, Pentagon Papers leaker Daniel Ellsberg, told Newsweek that if Congress can’t or won’t release the full report, a leak might be unavoidable. Yet a potential leaker may now have to take into consideration the arrest last week of Julian Assange and his possible extradition to the U.S. to face charges related to publishing leaked national security material, Jesselyn Radack, director of Whistleblowing and Source Protection at ExposeFacts and a lawyer for Edward Snowden, who has been charged with espionage, told Newsweek. There is at least one other option short of leaking. D.C.-based whistleblower attorney Mark Zaid told Newsweek that a Mandatory Declassification Review, which he said led to declassification in about 75 percent of cases, could be a viable alternative. Zaid also said he doesn’t believe the Assange arrest should deter potential leakers. “I don’t think Assange’s arrest materially, or in any way, changes anything with respect to whistleblowers’ ability to provide information to journalists,” he said, adding that he doesn’t consider Assange a journalist and that whistleblowing is never a legal defense to illegally disclosing classified information. According to Barr, Mueller did not find President Trump guilty of cooperating or conspiring with the Russians, but the report left open the question of whether Trump had obstructed justice. Among the points of intrigue was the president’s firing of FBI Director James Comey over what he termed “the Russia thing.” Barr concluded in his memo after having the report for barely 48 hours that an obstruction of justice charge should not be brought against the president. The report is also believed to delve into Trump’s murky financial dealings—with wealthy Russians, with hush money paid in violation of campaign finance laws and other potentially embarrassing, if not always criminal behavior. But it’s not at all clear how much of the report the public will get to see. Barr is expected to redact swaths of the report, including grand jury material and material deemed classified. Those two categories cover a potentially vast array of material, but Barr has added a third category for the black ink: material that might “unduly infringe on the personal privacy and reputational interests of peripheral third parties,” by which he said he meant private individuals, not public officials. Investigative journalists have published countless articles and many books about legally dubious Trump matters beyond just cybercrimes, including reports on how Russian oligarchs and Russian mafia had laundered billions of dollars through Trump-branded buildings in New York and worldwide, and how Trump got foreign loans, including apparently from Russia, when U.S. banks dropped him. An unredacted report will show whether or how far the Mueller report delved into Trump’s relationship with wealthy Russians and whether Mueller crossed what Trump called a “red line” between Russian election interference and his family business. Congressional subpoenas, however, are not always effective, since there is no guarantee the Trump White House will comply in a timely manner. The Bush administration was ruled in contempt of Congress for blowing off a Senate Judiciary Committee subpoena related to Iraq War emails in 2007, but Bush simply ran out the clock until Obama came into office. Multiple pending Freedom of Information Act lawsuits could force the Justice Department to release the full report. Hours after Barr reported he had the Mueller Report in hand, on March 22, the Electronic Privacy Information Center filed a FOIA request in a Washington D.C. federal court. “EPIC will be in unique position to challenge those exemptions as early as next week. We absolutely have the right to challenge every single withholding in the Mueller Report,” EPIC director Marc Rotenberg told Newsweek. Separately, the Reporters Committee for Freedom of the Press has also sued for access to potentially redacted grand jury material in the Mueller report. Meanwhile, the Trump administration is relying on the effects of Barr’s delayed rollout, including his explosive use of the word “spying” in reference to the origins of the investigation during congressional testimony last week, along with the redactions to diminish the impact of the report. The Trump-Pence 2020 campaign was fundraising off Barr’s “spying” claim in an email blast sent to supporters Saturday night. The prospect of a metastasizing special counsel’s investigation has always hovered over Mueller’s probe, haunting Republicans, in part because the Whitewater investigation into President Bill Clinton so successfully did just that. Conservative independent counsel Kenneth Starr began with the investigatory scope of looking into an Arkansas business deal, involving a $300,00 fraudulent loan. Six years later, the Starr Report, juiced by investigations initiated in an unrelated civil suit, led to impeachment proceedings over obstruction of justice and perjury, for Clinton’s lies about his relationship with intern Monica Lewinsky.